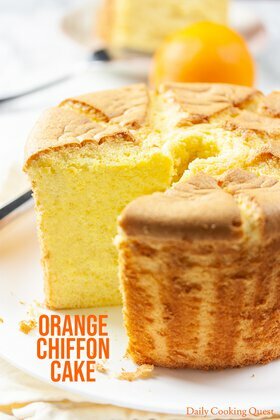 Chiffon cake, widely known as kue bolu in Indonesia, is a very elegant cake. A perfect chiffon cake should be very light, yet moist (not dry! ), and if you push it down with your finger, the cake should bounce back to its original shape. If your idea of a perfect chiffon cake is like mine, then this recipe will give you such a cake. 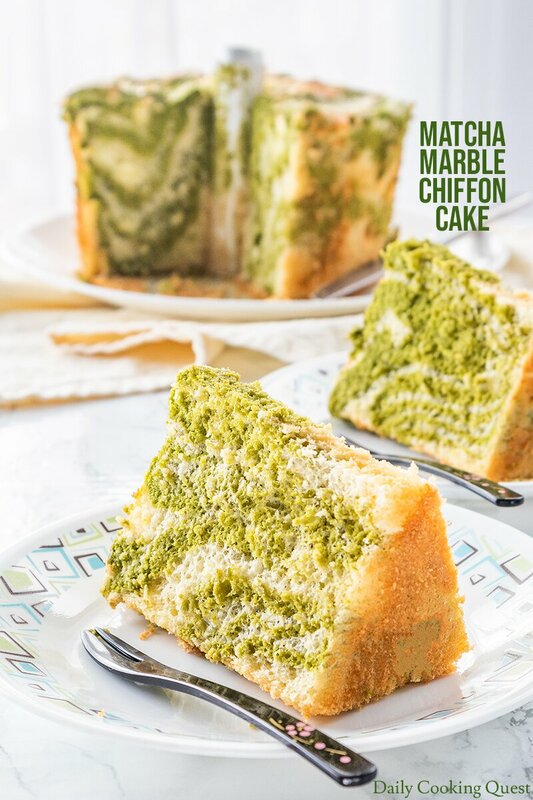 What you need to bake a matcha marble chiffon cake. Since we are going to bake a matcha marble chiffon cake, you will need to procure some matcha (Japanese green tea powder). There are two kinds of matcha, culinary grade, and ceremony grade. 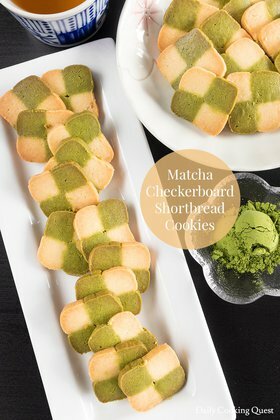 You don’t need to buy ceremony grade for cooking/baking purposes, though you may want to invest in ceremony grade if you love drinking good quality matcha. Having said that, you need to invest in good quality matcha, even for the culinary grade. Cheap matcha will produce a sickly green color, and your cake will not be delicious. 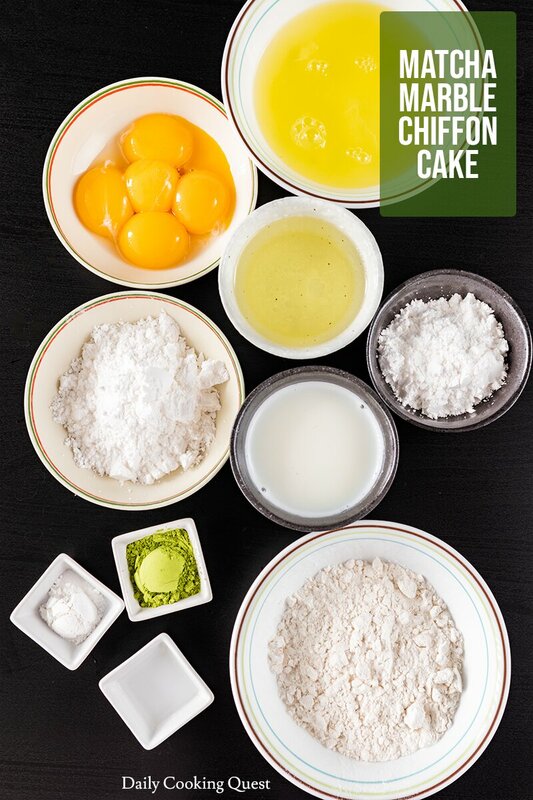 How to prepare the batter for a matcha marble chiffon cake. Another crucial thing to have to bake this chiffon cake is using the correct chiffon cake pan. 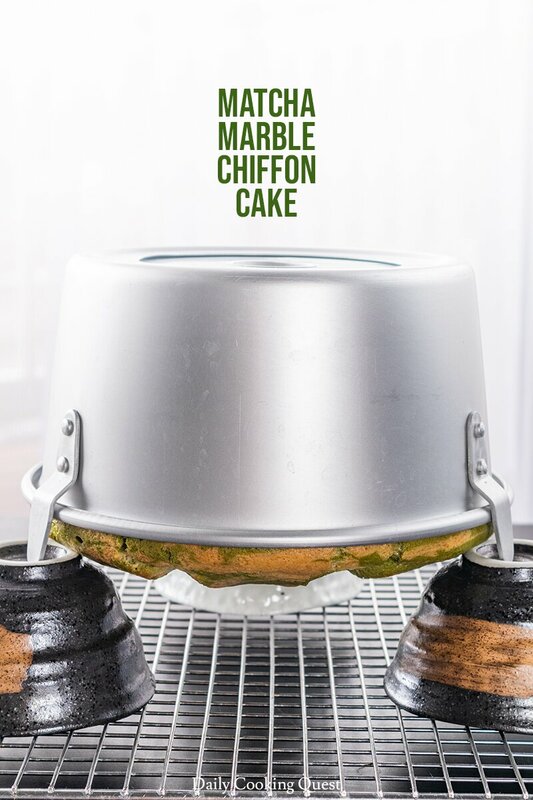 A chiffon cake pan looks exactly like an angel food cake pan, but you must get the aluminum version, and definitely avoid the non-stick version. A chiffon cake needs all the help to cling to the pan while it rises majestically in the oven, and it will fail miserably if you use a non-stick pan. For this recipe, I use a 7-inch chiffon cake pan, which is basically a half-size regular angel food cake pan. Alternatively, most people have had success when using an 8”x3” round cake pan, so if you have this pan at home (make sure it is aluminum and not the non-stick version), you can save money and no need to buy the 7-inch angel food cake pan. Invert the chiffon cake once it is out from the oven to prevent the cake from collapsing. To create the marble pattern, you simply need to pour the plain batter and the matcha batter alternately into the chiffon pan. A lot of recipes call for using a spoon/chopstick at the very end to give the batter a good swirl and believe me, I used to do this too, but this is so unnecessary. Simply pour about 1⁄5 of the plain batter into the pan, follow with about 1⁄5 of the matcha batter, then another 1⁄5 of the plain on, another 1⁄5 of the matcha, until you use up both kind of batter. You won’t need to swirl the batter at the end, and you definitely will still get the marble pattern. 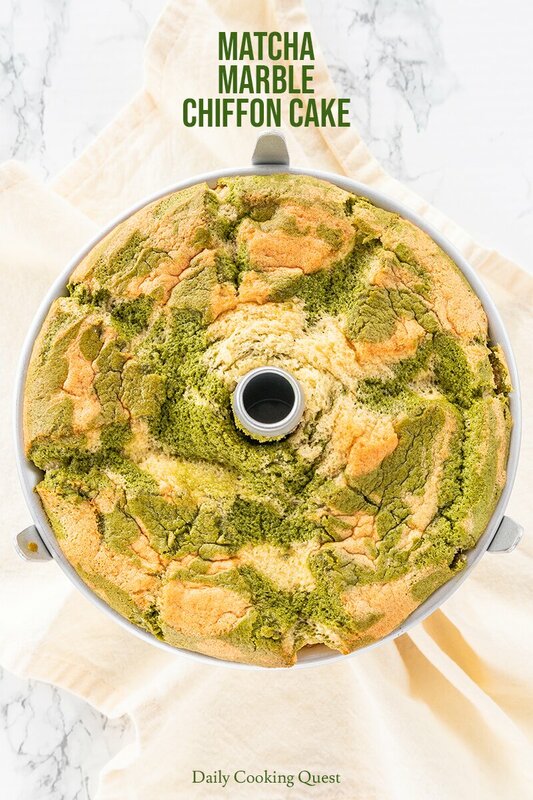 Matcha marble chiffon cake with a control cracked pattern. Basically, almost all chiffon cake will crack, though we use to always hide this cracked part by turning the cake upside down. Lately, a lot of bakers figure out a way to create a controlled cracking pattern, so the cracks looks designed, and not by accident. The one I create is the simplest cracking pattern, by running a sharp knife to create regularly spaced thin slits on top of the cake at the early stage of the baking once the top part looks set. This step is totally optional, and if you don’t mind the haphazard cracks that will form naturally, you can skip this step altogether. Preheat oven to 335 Fahrenheit (170 Celsius). In a mixing bowl, beat egg yolks and 30 gram powdered sugar until well mixed. Add in oil and milk, beat until well mixed. Add the cake flour mixture in 3 batches, and beat until well mixed. Set aside. In another mixing bowl, whisk egg whites until foamy. Then add cream of tartar (or vinegar). Add powdered sugar in 3 batches, and keep whisking until stiff peak. With a spatula, gently fold the egg whites into the egg yolks batter in 3 batches. Then divide the batter into two equal portions. Mix together matcha and warm mater into a uniform thick paste. Add the matcha paste into one portion of the batter, and gently stir until uniform. 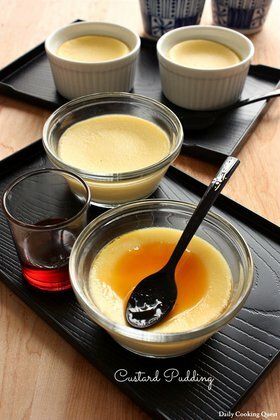 [Optional] Remove pan from oven, quickly make thin slits on the top to control the cracking pattern of the chiffon cake. Reduce heat to 300 Fahrenheit (150 Celsius). Continue baking for another 25-30 minutes, or until a cake tester comes out clean. Cool the cake by inverting the pan to prevent the cake from collapsing. Once the cake is completely cool, gently run a thin knife along the edges of the pan to unmold the cake. 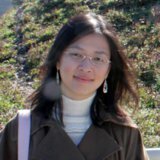 (*) I am using a smaller size angle food cake pan which holds 50% volume of a regular 10-inch pan. 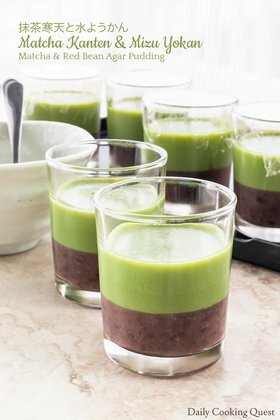 I love matcha, so I can't wait to try this recipe! It looks so wonderful! Matcha makes everything better! This cake is gorgeous! It looks beautiful! And I had no idea about picking out good matcha! Those tips are all so helpful!! 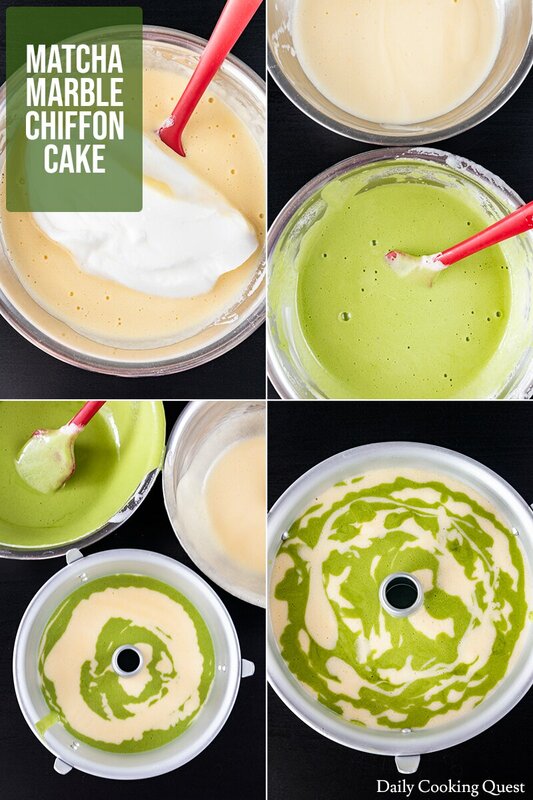 I'm obsessed with matcha lately and love the idea of trying it in a cake! This chiffon cake is so gorgeous! This looks so pretty! The matcha marbling sounds so good and looks so fun!